This is an interesting little book that I’m sure will someday be a rare collector’s item. When I say that the book is “little”, I really mean it. Its petite size is “cute”, according to my wife, who’s also a huge Rossi fan (she has an official Rossi T-shirt and hat and cheers him on while watching the races on the tube!). The book is a simple collection of photographs, tracing the history of The Doctor from his days in green leather with Aprilia right up to the current — and somewhat gaunt looking — Rossi of today. The mini-sized format means that the photos, taken by MotoGP photog Micro Lazzari, are also small, and what little text there is has both Italian and English translations. Most of the pages have more than one photograph and they are assembled in a collage style, so there’s lots of heavy cropping. It’s not really a book that will keep you interested enough to read through it many times, but it’s a joy to look through and remember each race. It’s sort of like a snapshot in time in the life of one of (if not THE) greatest motorcycle racer of all time. The price is very reasonable at $12.95, and for that kind of money, you could buy one, look through it a couple of times and throw it in a box in the attic and 30 years from now you’ll be very glad you did. I’m searching for words that will describe this interesting volume, because its size, format and content is unlike anything else I’ve seen. Even the cover is different; it has some padding underneath so it’s kind of soft and cuddly. 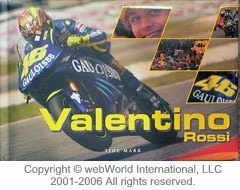 Think of it as having purchased someone’s collage of Rossi photos clipped from a magazine and pasted in a something about the size of an autograph book and you’ll get the idea. Speaking of autographs, if you could do one thing with this book, it would be to get Rossi to sign the cover. Then you’d really have gold.